One of the newest iOS 7(s aapl) features is certainly a time saver, but it can also make your lost iOS device harder to find. Yesterday, I mentioned the new Control Center as one of the five new iOS 7 features you’ll want to try right away. I still believe it adds to the experience, however, by default, it’s not secure: Lose your iPhone or iPad and someone can keep the Find My iPhone app from locating your device. Here’s how. By default, the new Control Center is made available on your lock screen without a passcode needed. Sure, that’s handy. Just slide up on your handset to open the camera app, enable AirDrop, or turn on Do Not Disturb. But one of the available options is to enable Airplane Mode. I’d welcome that for a flight, and why not? No need to unlock the phone and fumble in Settings to turn off the phone’s radios. Except that anyone can turn off the phone’s radios in the default mode, even if you have a passcode lock setup in iOS 7. For now, I’ve disabled Control Center on the lock screen. 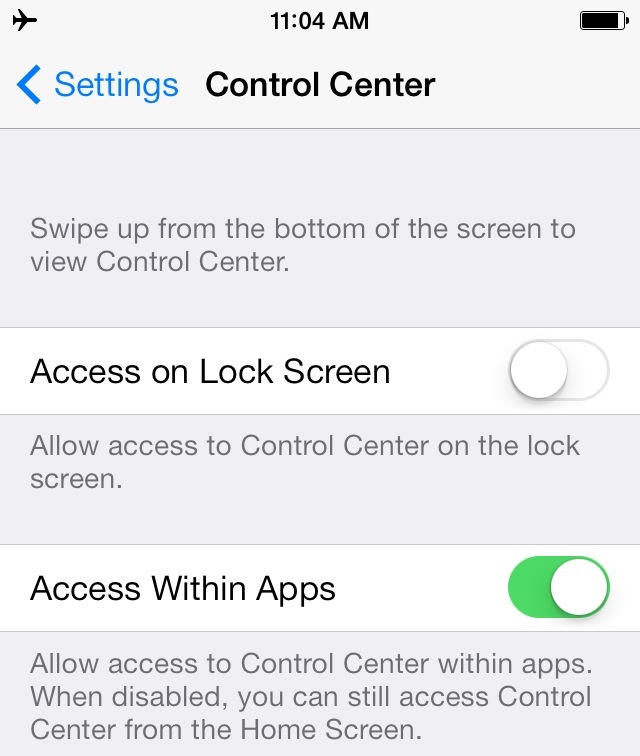 You can easily do this too: Go to Settings, Control Center and disable the “Access on Lock Screen” option. Again, on my iPhone 5 and my wife’s iPhone 4S, this was enabled by default. We both have passcode locks on our phones and in both cases, we were able to enable Airplane mode without any security check. Is this a huge security hole? No, I’d call it more of a security awareness issue. Why? Because a thief could essentially accomplish the same thing by simply pulling the SIM card out of your device or by turning it off. But I’d like to see Apple consider requiring the passcode for Airplane mode through Control Center. I don’t want anyone cutting off my iPhone from the web but me, especially if I lose it. This post was updated at 2:04pm PT to properly reflect the name of Control Center. The same can be accomplished through Siri when on lock screen… tell it to put phone on airplane mode! YES! Why hasn’t Apple done this? Police officer recently said law enforcement has concluded that Apple won’t do this, even after being asked by law enforcement because Apple wants us to buy a new phone when ours is stolen. Not sure if that’s true, but I can’t think of a good reason why Apple wouldn’t add this simple feature. Pass code to shut off. Easy! Will the erase iPhone function still work once the carrier has deactivated the sim? my iphone is unlocked and i don’t have the carrier sim, will I be required to sim activate my phone after downloading IOS 7? If yes can it be bypassed? I just realized. You can turn off the phone while the phone is locked. I was not able to turn it off before iOS 7. I will be reverting back now. What’s up with the Apple short-sightedness? I also do not think they ever anticipated that changing to a Lightening Cable will stop all phones from using ANY accessories while having a case. Then they started selling the cases that do not protect the screen just so you can use accessories. Even their lightening to 20 pin does not work with a proper case/bumper. Pulling out the SIM will not stop Find My iPhone from working. So they can turn off the phone, put it in a microwave etc. but the point is in order for it to be a useful phone again someone will eventually need to power it on. At this point it will be easy to see the message about it be stolen. So any potential buyer will not buy it. This should in theory lead to thieves targeting other phones or claiming they found it and collecting a reward. but it still doesnt give them a phone they can use or sell. Everything should be backed up to iCloud or other services anyway. All you would lose is the fun case that you bought. This is my biggest issue with ios7 so far. I’m glad others are noticing right away as well. I’m worried for the average consumer not being aware though. You can still turn the phone off from the top botton while the phone is locked!!! Every house these days has a faraday cage in it. Either a microwave or a refrigerator will work well. This whole problem would be solved easily if powering off the phone or entering airplane mode brought up the passcode authentication screen. Yes, they can still yank the SIM card, but I doubt the average thief will bother– the tray is a PITA and the phone will still connect up via wifi without the SIM. Apple should consider a separate battery to control constant power to prevent “Find my Iphone ” from ever being disabled, except by the owner! You should also have the ability to switch it on or off from Icloud via any computer! That would make the iphone, a phone no one wants to steal! This is silly. Removing SIM and shutting off the phone all do the same thing (prevent Find My iPhone) and can be done without a password. Hell, even if shutting off wasn’t possible and the SIM tray was locked or something, you could probably put the phone in a lead box or a faraday cage and effectively silence it that way. Being able to shut off radios from lock-screen doesn’t really do much to make the situation any worse. Bjdraw has a good point. If airplane mode required a passcode so will wifi. 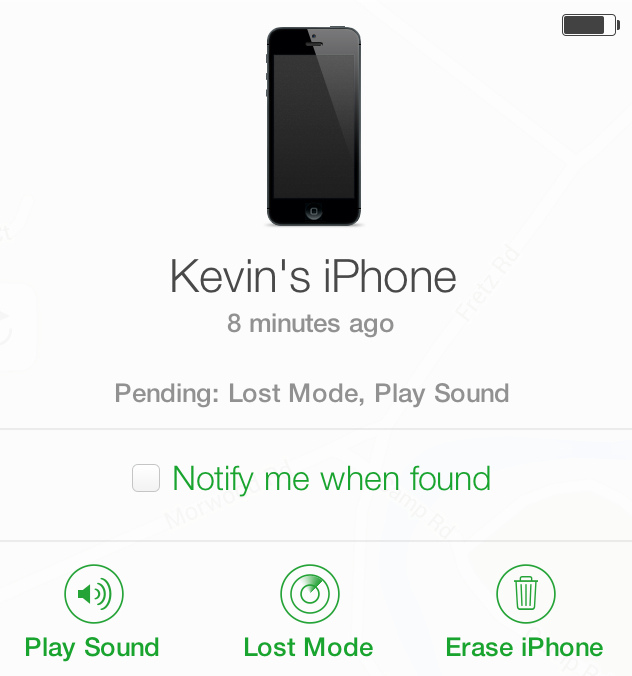 Find My iPhone still works in enable Airplane Mode? It will prevent you from putting your phone in lost mode, displaying a lost message on it, or physically locating your phone. But it won’t bypass Activation Lock. So in other words, neither you or the thief will get to use the phone. The thief could just use a computer to restore the phone (although he/she wouldn’t get any of your personal data). Say, where’d you get that Find iPhone screen shot? My version hasn’t been 7ified yet. Ah, that’s from my iMac on Safari. What I have never understood is why you are able to shut off the phone from the lock screen?